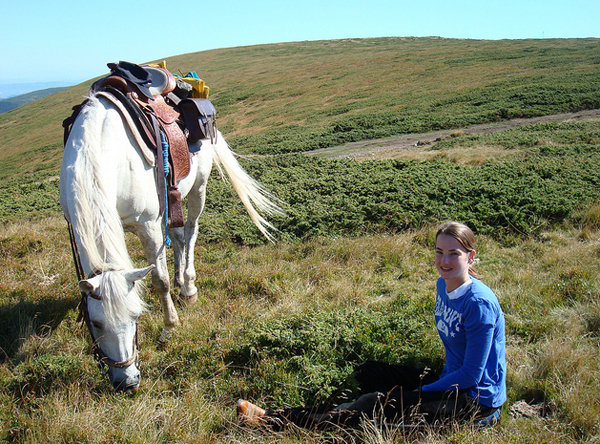 Horse Ride in Bulgaria -- a hidden gem in Southern Europe. Part of the European Union, Bulgaria is bordered by Romania, Serbia, the Republic of Macedonia, Greece, Turkey and the Black Sea. The temperate climate, rich history, wine and cuisine, and famous Bulgarian hospitality entices many travelers to visit Bulgaria. Many Americans also travel to learn more about their Bulgarian heritage. There's no better way to get off the beaten path and ride through the mountains to visit historic villages than on horseback. Travel mountain trails to take in fresh air and clear rivers, magnificent natural settings and old world culture. Combine riding adventures with other sightseeing in Bulgaria's capital city of Sofia or at Bulgaria's largest monastery, Rila Monastery. The owner of this riding company Dorte is Danish and her husband Christo is a native Bulgarian. The couple started riding tours in Bulgaria over 15 years ago. The base for these Bulgaria riding adventures is on the northern side of the Balkan Range in the mountain village of Apriltsi – in the heart of Bulgaria with the most fantastic panorama of Bulgaria's highest peak Mt. Botev. Apriltsi is about a three hour drive from the capital city of Sofia in a beautiful area. Behind the stables there's a pretty little creek and view of a mountain lake and the green and blooming meadows with wild flowers and old trees. The Guest House in Apriltsi is in the center of the village. It's a 5 minute walk to the central square where there's a market and a big exhibition hall featuring local art: paintings, books, ceramics, needleworks and more. Many artists live here, own summer houses or stay here for a certain period and many of their works are to showcased in town. There are also small shops, cafes, restaurants, a pharmacy and a stork-family has a nest on the top of a sculpture exactly in the middle of the square. These riding holidays allow you to experience this special area and the Central Balkan National Park, which adjacent to the stables, and the flavor for the local people. Enjoy classic mountain trails, Bulgarian food and culture. Start in the charming mountain town of Apriltsi and ride along ancient trails and over impressive mountains, through mountain passes to waterfalls and villages. 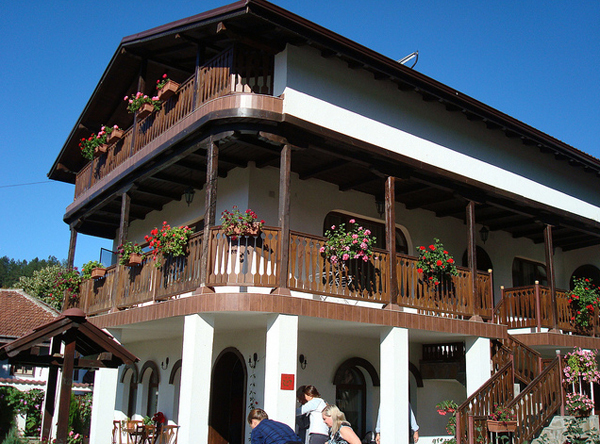 Spend nights in simple mountain chalets, the newly built guest house and historic monasteries. All tours start in either Apriltsi or Svezhen. Bulgaria is known for its pleasant weather. It’s possible to ride all year round. Expect to bring warm clothes and rain gear as the weather changes frequently in the mountains. Here is a list of of items recommended. In addition, please see EquitrekkingTravel.com's General Packing List. riding helmets are strongly recommended. You need to bring your own helmet. Laundry facililies: Laundry is not available on progressive rides, but when this riding vacation is part of a longer tour in Europe, it is possible to leave your laundry in Aprlitsi before the riding vacation and when come back from the trail riding vacation, it will be ready for you. Please use a duffel bag or sports bag not weighing more than 15 Kg or around 30 lbs. You can leave any bags in Apriltsi upon arrival.The luggage is transported for you from locatation to location. There is some cell phone coverage in Apriltsi, depending on your provider. The electricity is 220 Volts. An adapter or a transformer may be required. There is usually only one plug in each room. The 32 horses used are East Bulgarian horses and crosses between East Bulgarians and Arabian thoroughbreds. These breeds are well suited for the mountain trails as their strength and power allows them to take on the terrain with ease. The horses are trained at the riding center and taken care of the year round. Surrounded by beautiful fields, there is a small Western bar situated with a view over the mountains and the grazing horses. Here, riders can buy something to drink and enjoy the view. 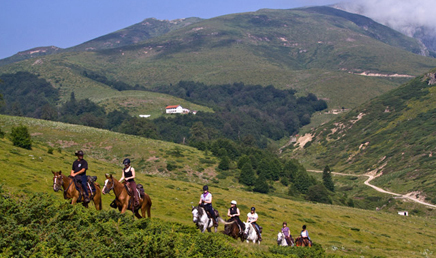 While riding these horses, you will be shown marvellous and outstanding nature in relaxing surroundings. Each day, the horses are saddled and ready for riders, so you may just come prepared with your own equipment and be ready for an adventure! Western saddles are uses to ensure comfort on the trails. The riding guide accompanies you throughout the journey. The National Park is one of the most valuable and among the biggest protected areas in Europe. It is over 10,000 acres. Established in 1991 in order to protect the unique nature, flora and fauna, the brown bear is the symbol of the park. The Balkan Mountain Trail ride follows the old paths through the Central Balkan National Park and the Trail to "The Singing Rocks” takes place close to one of the reserves in the park. On all tours from May to September, a three night stay in the National Park is included. Not long ago Apriltsi was four independent small villages. Now it is one town with almost 5000 inhabitants. Situated high up in a mountain valley with enchanting view, there is fresh, pure mountain air here. There are very few cars in the area. Apriltsi's main road becomes a gravel road that leads into the mountains. Many painters, musicians and writers have found the freedom to be creative in these surroundings and their houses are active workshops. Another nearby town is Troyan – about 25 km or 15 miles from Apriltsi. Known for its shopping streets and cafés, the town started as a craft center in the 19th century. Troyan is located close to the third biggest monastery in Bulgaria: the Troyan Monastery. Zahari Zograph, a popular Bulgarian painter who also painted the central church of the largest monastery in Bulgaria (Rila Monastery), painted the interior and exterior of Troyan Monastery. It is possible to visit on a day trip by car. About 50 km or 30 miles from Apriltsi is the city of Gabrovo, where the famous ethnographical museum Etara is located, with houses and buildings from medieval Bulgaria. Further north is Veliko Tarnovo – once the capital and now well known for its architecture and the fortress Tsarevets, an imposing a medieval stronghold located high atop a hill. Near the Valley of Roses is this small and almost forgotten village. Full of exiting history, this town is surrounded by mountains, old woodlands, and open meadows with cows and fields. This old village exudes history and atmosphere. A hidden gem! Bulgaria's capital and largest city, this Western Bulgaria city is a walkable mix of old and new. There's a lot to see here including history museums, onion-domed churches, ancient Roman, Byzantine and medieval Bulgarian buildings, Ottoman mosques and Red Army monuments. Located in a valley in the Rila Mountains, this is Bulgaria's largest and most famous monastery. A Unesco World Heritage, visitors marvel at its frescoes. Contact us to book these trips and add on additional days for sightseeing and other tours. When you choose a week on the Center Based Ride, you’ll stay in the same house every day, following the typical daily life of a small Bulgarian town. Goats are still walking though the streets. Chickens live in the backyard. The basic tour includes private accommodations in a house with the other riders, which in Bulgaria compare to Bed & Breakfast Inns. Double rooms and common bathroom facilities. Another option is to stay in one of the small hotels ( for an additional fee), and some of these, having swimming pools. The Balkan Mountain Trail 2 nights in Apriltsi based on accommodation in Family Hotel, double occupancy with shower/toilet. 4 nights in mountain chalets based on 2-3-4 bedded rooms with shower/toilet on the floor. 1 night in a monastery based on double occupancy (2 rooms sharing shower/toilet). Full board: Breakfast, Lunch, Dinner. (Lunch is organised as picnic, lunch package or ordinary lunch). The Trail to "The Singing Rocks" is 3 nights in Apriltsi based on accommodation in Family Hotel, double occupancy with shower/toilet. 1 night in a private house and 1 night in a mountain chalet based on double occupancy with facilities on the floor. 1 night in mountain chalet with 2-5 per room facilities on the floor. 1 night in mountain chalet 2-4 per room with shower/toilet. On the Panaroma Trail 2 nights in Apriltsi based on accommodation in Family Hotel, double occupancy with shower/toilet. 5 nights in the mountains: 1 night in mountain chalet 2-4 per room with shower/toilet; 1 night in family hotel in twin/double with facilities, 1 night in bungalow with 4-5 beds and toilet/shower, 1 night in mountain chalet with 4-5 beds per room and shared facilities, 1 night in private renovated 100 yrs old house in 2-3 bedded rooms with shared facilities. 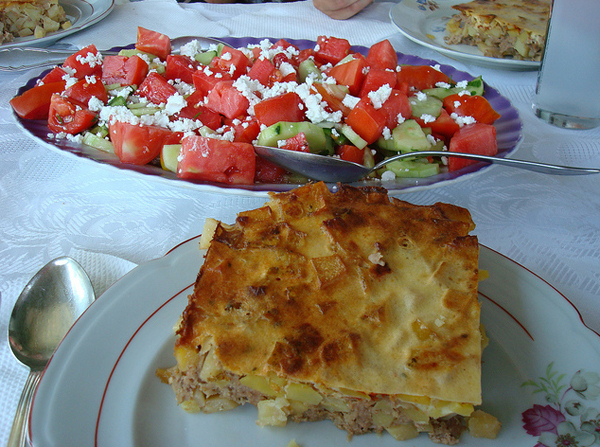 The Bulgarian cuisine is similar to Greek cuisine. A typical Bulgarian summer meal often begins with a salad and a rakija (brandy). The main course is enjoyed together with a glass of the delicious local wine and the dessert is usually fresh fruit. During the summer months, Bulgaria is a paradise for vegetarians as most traditional Bulgarian meals are based on fresh and sun ripened vegetables. They are prepared with or without meat. Apart from trout, fish is a rare dish in the mountains. During the daily rides a picnic is organized for lunch or a packaged lunch is provided. Expect cozy and simple mountain restaurants /dining rooms. All meals are included. Beer, wine and alcohol that are available for a fee. Please contact us to help you plan your vacation. Travel enthusiasts who want to try something different on their riding vacation, discover history and culture, a hidden gem in Europe, mountain nature and perhaps discover their Bulgarian heritage. All levels of riders can be accommodated on these vacations. Rivers, steep mountains, and various terrain suites all types of riders. The riding guides will take the beginner riders separately from the experienced riders, who may gallop the natural riding paths, while beginners trek more slowly. The paths in the beautiful valleys and in the mountains were created specifically for galloping. For the experienced rider this is a challenging but exhilarating ride through mountainous terrain. When you choose a week of the Center Based Riding Vacation in Bulgaria, you’ll stay in the same guesthouse every night and enjoy being immersed in the typical daily life in a small town in the heart of Bulgaria in the Balkan Mountains. The riding center is in the charming village of Apriltsi, where many artists reside because of the inspiring natural scenery. Enjoy a variety of daily mountain rides to a monastery, villages, and into the Central Balkan National Park. This trip departs every Saturday all year long. The size of the group depends on the week selected. Please ask us for more information. * Prices are subject to change based on currency conversions. Single Supplement wiill not be charged if guest is willing to share a room. Single supplement in the hotels in Hisarya, Plovdiv or Sofia to be announced accordingly. 7 nights in Apriltsi based on accommodation in Family Hotel, double occupancy with shower/toilet. Full board: Breakfast, Lunch, Dinner. (Lunch is organized as picnic, lunch package or ordinary lunch depending on the rides). Riding guide 6 days and interpreter (English speaking). Horse & equipment. Transfer from/to Sofia airport at set time. All alcohol and optional excursions. International Flights to Bulgaria. Several excursions are available during stay at the riding center. There is an additional fee for these excursions. Depending on the time of the year and the weather conditions, you may do an extended mountain ride with an overnight stay. Please ask us for more information. Bulgaria Horse Riding Vacation Itinerary: This a sample itinerary as new routes are constantly being explored and added. Airport pick up and transfer to Apriltsi, a beautiful, rural town in northern Bulgaria that is developing for tourism due to its beautiful valley location in the Balkan Mountains. Apriltsi has a tiny town square, shops and school. Many artists and craftsmen have settled here, inspired by the area scenery. The guest house, riding center and stables are just outside of the centre of the village. Accommodation in a cozy, new guest house in the center of the village in double rooms with shower / toilet. Welcome dinner. This new guesthouse has a nice dining room with a little western bar where riders can buy something to drink and enjoy the view over the mountains and the grazing horses. There's also a garden. All rooms have a shower / toilet, cable TV and wireless internet. Most rooms have a balcony. Depending on your time of arrival you will meet the riding guide and talk about the program for the week. After breakfast, walk down to the stables and meet the horses for the first time. The riding guides will introduce you to your horse and explain how they ride in the mountains. You'll learn more about how the horses like to be ridden and special considerations the mountain terrain. Ride out and enjoy a a picnic lunch near the stables. After lunch, ride for around three hours in the area to get introduced to Bulgaria on horseback! Night back at the guesthouse at the riding center. After breakfast, leave the village on a horseback for a ride to the green meadows, where you may walk, trot and canter. Experienced riders may enjoy a good gallop! There is a lot of natural riding paths in the beautiful valleys and in the mountains. Many of them are as created for galloping. For the experienced rider, there are many possibilities for challenging riding in the mountains. Less advanced riders may enjoy taking it slow. From the meadows, ride to the river and enjoy lunch in a picturesque spot. After a break, ride for two more hours back to guesthouse. Today, ride up into the mountains and view the wildlife in the area. The ride takes place over 1000 meters above sea-level. Stop for lunch amid the mountain scenery. In the evening, ride out to search for more wildlife in the area near Apriltsi. Ride over the hilltop of Ostrets and Peperi – under the Black Peak, the summit of Vitosha Mountain in Bulgaria, to a small monastery. Enjoy lunch in the monastery garden. Trek back to the riding center through fields and meadows and along a river. Horse ride into the National Park. The ride will take you to Vidima, a small village, to the Vidima Waterfall, one of the largest waterfalls in Bulgaria. A small path allows you to walk up on foot to the top. The horses rest until you return. After lunch, ride in the park and enjoy all the hidden treasures of nature. Now having seen some of the countryside, today you may choose from a variety of possibilities. The group can chose from mountain riding, to riding through one of the small villages, a monastery trek or other sights in the area. Any option will take you over the picturesque landscapes. Tonight enjoy a good-bye dinner. After breakfast, depart for the airport. * Please note this itinerary is flexible and subject to change based on the weather or the trip guide's discretion. A classic trail over two mountains. Start in the charming mountain town of Apriltsi and ride along ancient trails and over impressive mountains, through mountain passes to waterfalls. Every day is absolutely unique. Spend nights in simple mountain chalets, the newly built guesthouse and a historic monastery. 2 nights in Apriltsi based on accommodation in Family Hotel, double occupancy with shower/toilet. 4 nights in mountain chalets based on 2-3-4 bedded rooms with shower/toilet on the floor. 1 night in a monastery based on double occupancy (2 rooms sharing shower/toilet). Full board: Breakfast, Lunch, Dinner. (Lunch is organized as picnic, lunch package or ordinary lunch). Riding guide 6 days and interpreter (English speaking). Horse & equipment. Luggage transport. Transfer from/to Sofia airport at set time. Accommodation in a cozy, new guest house in the center of the village in double rooms with shower / toilet. Welcome dinner. This new Guest House has a nice dining room with a little western bar where riders can buy something to drink and enjoy the view over the mountains and the grazing horses. There's also a garden. All rooms have a shower / toilet, cable tv and wireless internet. Most rooms have a balcony. Bulgaria is known for its many monasteries and today you'll ride to a smaller, working one and spend the night-- a special experience! The trail continues through the National Park over the Balkan Mountains and Mt. Botev, the highest peak of the Balkan Mountains. The Mariza Plains are visible and vast from this height. After the 6-7 hour ride, end the day at a small monastery, the Kalofer Monastery, where you'll spend the night. The facilities here are shared and each room has 2 beds each. In the morning, explore the monastery and life in the small town of Kalofer, which dates back to the 16th century. Bulgarian poet and revolutionary Hristo Botev was born here. In 2004, Kalofer was recognized by "Conde Nast Traveler" magazine for its excellence in ecotourism. The morning is spent riding over the mountains to Apriltsi, back to where you began. After a 6 hours ride, you will be welcomed back to the stables and the guest house. Enjoy breakfast and say good-bye to the horses. You'll have some free time until you depart for the airport. The Singing Rocks themselves are a set of unique natural formations that crown ancient beech forests in Central Bulgaria. For centuries, this place locals have claimed to hear sounds from the rocks, as if the rocks were singing in the wind. This reserve is also home to many are animals including brown bear, golden eagles, deer and other rare birds. The pace and terrain vary on this ride. The hilly paths and the open land on the mountain tops allow for great riding. 3 nights in Apriltsi based on accommodation in Family Hotel, double occupancy with shower/toilet. 1 night in a private house and 1 night in a mountain chalet based on double occupancy with facilities on the floor. 1 night in mountain chalet with 2-5 per room, facilities on the floor. 1 night in mountain chalet 2-4 per room with shower/toilet. Full board: Breakfast, Lunch, Dinner. (Lunch is organized as picnic, lunch package or ordinary lunch). Riding guide 6 days and interpreter (English speaking). Horse & equipment. Luggage transport. Transfer from/to Sofia airport at set time. Accommodation in a cozy, new guest house in the center of the village in double rooms with shower / toilet. This new guesthouse has a nice dining room with a little western bar where riders can buy something to drink and enjoy the view over the mountains and the grazing horses. There's also a garden. All rooms have a shower / toilet, cable tv and wireless internet. Most rooms have a balcony. Depending on your time of arrival you will meet the riding guide and talk about the program for the week. Enjoy a welcome dinner. Enjoy breakfast and say good-bye to the horses. Free time until departure for the airport. The trip was absolutely amazing. All the people working for the company were incredibly friendly and knowledgable. The airport pick up and drop off went exactly as expected. The trails were just beautiful, the food was spectacular, the lodgings weren't ever going to be nominated for 5-star status, but every place we stayed was perfectly fine and in a beautiful setting. They import all their tack from the US, so an American Western rider will be right at home. The horses were great and easy to get used to the for trails. The spend a lot of time with and take great care with the horses, which considering how hard the horses work each week, it was good to see. They did say I was their 2nd American for this season, and it is a shame because it was beautiful, challenging and incredible riding. I know it takes a while to get there, but it was well worth the trip. The food was amazing. All fruits and vegetables we ate were fresh, usually from a local garden next to the house or lodging. They do serve pork at every meal, so they ended up making vegetarian meals for me (and one other person in the group). At one of the guest houses where we stayed for two nights, the guy even made a special chicken dinner for me. It was extremely thoughtful and unexpected. They recommended 100 Leva for the currency exchange, and they were right on the mark. I don't drink very much, so I ended up having more than half leftover, but for some people it would be just right. They were very easy to work with and the whole trip exceeded my expectations. It is definitely a trip I would recommend. Highlights: Variety of scenery, wildlife – birds, butterflies, deer, Tiger! – The horse! Thank you for a great experience. I appreciate your flexibility to ensure I had an enjoyable program. The Guest House is excellent. I look forward to returning to Bulgaria/Apriltsi another time. The whole trip was very well organised and the food was excellent. The horses were all well suited. Highlights: Waterfalls – runs in the “Valley of Roses” – Forests and horses! A very good trip, wonderful and colored landscapes, beautiful forests and guides and horses were as we could have dreamed, calm and present for us!! A memorable week, unable to forget it and everyone we met! Highlights: Challenging down-climbing, the very good social atmosphere, the guides. The horses were very well trained! The program described the daily riding tours a little bit longer than they were. This trail has been a fantastic experience for me. It has been very challenging – especially when I climbed down the mountain, but because of the guides it has been a very good experience. It has developed my riding skills, and I have managed to cross my limits in a good way. Highlights: The nature, the leaders, the lovely horse I had. This trip was absolutely perfect!!! I have enjoyed every hour. Something new happened all the time!! I think the meals were too big ☺ Thanks for all!! Two expert authors, 80 days of in-country research, 35 detailed maps and a new chapter on Bulgarian wine. Kaplan combines the skills of an old-fashioned literate traveler and an informed journalist in this eloquent, opinionated report that interweaves history, art and culture of Yugoslavia, Bulgaria, Romania and Greece with recent events to paint a portrait of the region in the 1980s. This new edition includes six opinion pieces that he wrote for the New York Times and Washington Post in the 1990s. Named one of the best of 1993 by the "New York Times." A highly readable, illustrated introduction to Bulgaria's history from medieval empire to Ottoman rule, revival and modernization, to the fall of Communism. Normally up to 10 maximum. Imtermediate to Advanced for the Panorama Trail. Trail to "The Singing Rocks"
Book 8 riders on the same trail riding vacation date and pay for 7! These rides start about 112 miles (180 km) from Sofia, about 3 hours by car. Airport arrival and departure transfers at set times.